This is too good to leave on the cutting room floor. Jay and I asked Alex to look sternly into the camera for a hero shot in Times Square, NYC. Apparently Alex the TV star can't take direction. Rather than a stern look, we got an uncontrollable laugh. And as a good laugh often does, it spread. By the end of it Jay and I were also howling and so were people around us. Jay just put together a quick reel of Alex having a chuckle in the city and the Red Giant rolling through Times Square. Enjoy. Love it, and I know that the main reason for all this, even beyond the interest for a great doc, further more important than your own passion for travelling, I can even bet that is higher up there with the appreciation for a good drink and the love for your friends, Yes, that huge grease trucker meal Patterson's Family Restaurant style on a hangover sunday awaiting for u on each US road stop. Simply LOVE IT!!! Good work you guys. Keep on making miles. I hope one of you puts those furmoans to work. Happy Trails! Keep the posts coming. Hopefully the "furmones" didn't attract the wrong kind of attention. 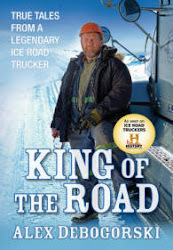 I spoke to a friend of mine today who is a huge Ice Road Truckers fan. He records all of the episodes. When I told him about the book tour and blog he was totally surprised. He had not heard anything about the adventure. Someone in the Canadian media needs to do a story to let Alex's Canadian fans in on the fun.